Over the years I've been fascinated by Roman Catholic evaluations of Luther and the canon. If there's one area in Luther studies in which many Roman Catholics typically drop the historical and factual ball and employ blatant double standards, this is it. After a few years of discussions on this topic with Roman Catholics I put together Luther’s View of the Canon of Scripture. This paper has been up since at least 2005 (previously hosted on NTR.min). Since then I've put together many blog entries on this subject as well. Luther is simply one person from history who made statements about the canon. He wasn't Marcion or the Protestant pope. Protestants (and even Lutherans) don't follow his opinions on the canon, as if Luther was an infallible authority. There were many people throughout the history of the church that had particular views on the canon. Luther though gains center-stage over most of them because Roman Catholics typically paint him as that personage who tore the church asunder. I've documented the vilification of Luther often on the blog. The canon subject is just one more nugget of propaganda Roman Catholics use to argue for the infallibility of Romanism. Keep in mind, the argument between Roman Catholics and Protestants isn't really about the canon, it's about authority. The argument typically goes that only an infallible authority can provide canon certainty. Luther is brought up by Romanists to demonstrate that without an infallible authority, the canon is up for grabs. Each Protestant is free, like Luther, to decide which books to keep and which to toss in the Elbe. Such a position ignores history, as well as Romanist paradigms (as I'll explain in conclusion). 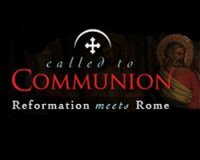 Recently I was sent a link to the blog Called To Communion (Reformation Meets Rome). The writers of this blog were "former Reformed Protestants who have entered into full communion with the Catholic Church." This article, The Canon Question was written by CTC contributor Tom Brown, who "After being challenged by a Catholic friend on ecclesiology and canonics, and following six years of discernment, Tom entered into full communion with the Catholic Church at the 2010 Easter Vigil" (bolded emphasis mine). While the entire scope of the article deserves a full response, I'd like to take a look at Mr. Brown's The Canon Question as it relates to Luther, and see how this recent convert deals with Luther and history. The Luther material is primarily found in section e. "That Which Preaches Christ: a Canon Within a Canon." I'm going to pull out some of the main points, and offer responses. Mr. Brown's words will be in red. The odd thing about the article is that Mr. Brown begins by saying he wants to argue against Reformed theology and its explanation of canonicity, yet Luther and Lutheranism receive an entire section. While the Reformed and Lutheran communities share similarities and differences, they aren't exactly the same thing. I simply found it amusing that Luther found his way to Geneva, (so to speak) in Mr. Brown's article. I can appreciate Mr. Brown's use of F.F. Bruce (The Canon of Scripture), and Paul Althaus (The Theology of Martin Luther), as well as number of other Protestant sources throughout his blog article. In regard to his Luther information specifically, it appears he relied on secondary sources, rather than citing Luther directly. The primary use of secondary sources in regard to Luther is a strong tradition of new converts to Romanism. Not being careful to dig a bit deeper into history with Luther can often lead to caricature and distortion. Luther answers the Canon Question by looking internally at the teachings of candidate books themselves. “‘What preaches and urges Christ’ was for Luther the criterion of apostolicity and canonicity.” That is, Luther started with Christ, the heart of the Gospel (or his own understanding of Him) and then reflected upon various texts to determine whether or not they preached and urged Christ. If so, they were canonical. This is true, but not the entire picture. Understanding Luther on the canon issue demands approaching him from two equally important perspectives: 1. Luther’s perspective on the canon as a sixteenth century Biblical theologian. 2. Luther’s personal criterion of canonicity expressed in his argued and exegeted theology. The former is rarely addressed by current popular Romanist apologetics. The later is typically caricatured as subjectivism. In regards to #1, Luther also took historical information into consideration. For instance, when he rejected the canonicty of James, he equally argued that James was not of apostolic origin. Even when provided with the typical Protestant harmonizing solution between James and Paul, for Luther, James was still rejected because he argued it was not of apostolic origin, but from a later period. Luther puts the same type of historical arguments forth for Jude, Hebrews, and Revelation. Luther was also familiar with those throughout church history that either rejected or questioned the canonicty of these books. Of Revelation he says "Many of the fathers also rejected this book a long time ago." Luther begins his treatment of Hebrews by pointing out that throughout Church history it has had a “reputation” of uncertain canonicity. Similar to Luther’s comments on James, we find that his questioning of Jude primarily has to do with its status in Church history and its internal evidence as to its apostolicity. During Luther's period of history ad fontes took a giant step forward. Recovering earlier sources, applying literary criticism to determine genuineness- these were aspects of Luther's studies as well as some of his educated contemporaries. Roman Catholic contemporaries of Luther also sought to determine once and for all which books truly were canonical by looking at internal and external evidence. Erasmus had a critical attitude to the same four New Testament books Luther did. Cardinal Cajetan questioned the canonical status of Hebrews, James, II Peter, II and III John, and Jude. The apocrypha likewise was under scrutiny. Even at Trent, there was a group of well-educated Roman Catholic scholars that argued against including the apocrypha in the canon. They did so not because the Holy Spirit told them so, but because of historical and exegetical considerations. But Luther’s canon criterion has problems too. Objectively applied, this test would seem to allow ancient Christian art to be “canonical,” so long as it urges Christ. Why would Luther's criterion ever be objectively applied in such a way? Luther never argues that God had inspired ancient Christian art, or sought to apply his criterion objectively over all of Christendom. Externally, the Christian church had passed on the Bible as God's word to Luther, and the church testified to its divine nature (and she didn't need to be infallible to do so). Internally, if one is indeed a Christian, the very words of God will ring true in the heart. There is nothing outrageous about the words of Scripture subjectively interacting and appealing to a person's soul. God hasn't breathed his Holy Spirit into art as Theopneustos. He has spoken to his people through the written word. Inherent in this statement is the idea that Luther knew the canon only through subjective means and therefore without an infallible interpreter he couldn't know anything with certainty about the canon. Contrarily, Luther actually argued his position. He didn't simply say "the Holy Spirit gave me a warm feeling about a particular set of books." In regard to the New Testament, Luther argued exegetically throughout his writings that a canonical book demonstrated apostolic authority: "Now it is the office of a true apostle to preach of the suffering, resurrection, and office of Christ." He didn't simply leave it at that. The corpus of his writings demonstrate his unpacking this over and over again. He argues and proves the apostolic character of a book. It would be the responsibility of a Romanist to dispute Luther's exegesis in regard to the apostolic character of a particular book. “Roman Catholic theology has up until the present day, frequently condemned Luther’s method of approaching and validating the authority of Scripture as subjective and arbitrary. But Luther is as far from heaven is from the earth in determining the center of Scripture by himself and self-confidently presenting his theology as this center” [Althaus, The Theology of Martin Luther, 336 – 337]. Since Mr. Brown has this book, I suggest he revisit the argumentation provided therein. Simply saying Luther relied on some sort of internal testimony of the Holy Spirit neglects his work as an exegete and a Biblical scholar. When Luther determines an author is "preaching Christ" he goes on to demonstrate it indeed does. Luther spoke boldly against the value and even reliability of certain books that all Protestants treat as canonical. How was it that [Luther] came to consider the question of the canon at all? There were a number of factors that almost compelled him to do so. Towards the end of the middle ages uncertainty had arisen in the Church not only concerning the canonicity of the Old Testament Apocrypha but also concerning the extent of the New Testament Canon; an uncertainty that existed in actual usage rather than in the attitude of the official Church. Many medieval Bible manuscripts included a fifth Gospel, the Gospel of Nicodemus; many manuscripts and all the printed German Bibles included an additional epistle of St. Paul, the so-called Epistle to the Laodiceans, which is even to be found as late as 1544 in Dietenberger's Roman Catholic translation of the Bible” [M. Reu, Luther’s German Bible: An Historical Presentation Together with a collection of Sources (Ohio: The Lutheran Book Concern, 1934), 175]. Further, when Luther spoke "boldly" on canonicity he often would follow it up noting his words are his opinion. He allows for the possibility of his readers to disagree with his conclusions. Simply read Luther's Prefaces in LW 35. One cannot miss this. This is a popular Romanist argument against Luther. The idea is that Luther only abandoned 2 Maccabees as canonical scripture when cornered by Eck in debate over the issue of purgatory. What's interesting about Luther's debate with Eck is that at this time in history Luther still believed in purgatory. I would argue, Luther rejected 2 Maccabees because he was well aware of the tradition of this book. When Eck cited it, Luther did what any Biblical scholar would do: point out its spurious nature. Luther was heavily schooled with the Glossa ordinaria, so he was well aware of the nature of the apocrypha. There is no positive evidence that Luther accepted the full canonicity of the apocrypha previous to his encounter with Eck. One may find Luther quoting the apocrypha previous to the Eck encounter, but one finds the same method citation of the apocrypha after the encounter with Eck. What one needs to do is actually look at Luther's real reasons for rejecting 2 Maccabees. Rarely will a Romanist do this, and Mr. Brown is no exception. One thing most telling about Romanist interpreters of Luther is how they make so much of so little. There isn't a lot from Luther on the canonicty of Esther, nor does the quote above even address Luther's opinion of the canonicity of Esther. "Bruce" refers to F.F. Bruce's book, The Canon of Scripture. The Luther quote being used is a Table talk quote (a favorite Romanist source in establishing Luther's opinion). The Tabletalk wasn't written by Luther. It's the recollections of what Luther said recorded by his associates. So for Mr. Brown, a second-hand quote is good enough to establish Luther's view of Esther. For this very Luther quote, Bruce provides this footnote: "too much weight should not be laid on many of the obiter dicta in Luther’s collected Table Talk." The idea that Luther rejected the canonicty of Esther isn't as clear cut as a stray Table talk infers. Roger Beckwith (author of The Old Testament Canon of the New Testament Church) has said, “It is sometimes said that Luther, following certain of the Fathers, denied the Canonicity of Esther, but Hans Bardtke has questioned this, as not taking into account of all the evidence (Luther und das Buch Esther, Tubingen Mohr, 1964).” One needs only to pull out Luther's Bible and note where Esther is placed. Luther doesn't place it in the section of apocrypha. He includes it with the canonical Old Testament books. In fact, in his Bible prefaces, Luther distinguishes the particular non-canonical parts of Esther, and place them with the other apocryphal writings. As to "I hate Esther and 2 Maccabees so much that I wish they did not exist; they contain too much Judaism and no little heathen vice," the quote doesn't end there. It wasn't the Spirit simply speaking to Luther's heart. He actually went on to explain, "The Jews much more esteemed the book of Esther than any of the prophets; though they were forbidden to read it before they had attained the age of thirty, by reason of the mystic matters it contains." Luther's statement has far more to say about Jewish interpretation than about its canonicity. I've only come across one explicit quote from Luther's own writing in which a rejection of the canonicity of Esther can be inferred, and even that quote has interpretive problems. Here's where a little more digging into the primary sources would've helped Mr. Brown. Luther viewed Revelation more negatively in his 1522 preface, which is what Brown cited. Luther rewrote the preface entirely in 1530. The rewrite is hardly ever referred to within anti-Luther polemics. True, Luther never appears to have explicitly added Revelation to his list of “chief books.” However, his tone of writing in the 1530-revised preface contains only a remnant of the doubt as to its canonicity. Because of Luther's battles with the papacy, and his certainty of living in the last days, the book of Revelation was treated much differently later in his career: “Because its interpretation is uncertain and its meaning hidden, we have also let it alone until now, especially because some of the ancient fathers held that it was not the work of St. John, the Apostle—as is stated in The Ecclesiastical History, Book III, chapter 25. ﻿ For our part, we still share this doubt. By that, however, no one should be prevented from regarding this as the work of St. John the Apostle, or of whomever else he chooses.” Indeed, the book did come to have prophetic value for Luther. Nor are Luther's concerns over the authorship of Revelation without precedent. But most of all, notice that again, it wasn't a blatant subjective feeling that provoked Luther's comments, as Brown argues. Luther doesn't simply say, "The Holy Spirit has not internally witnessed to me that this book is canonical." Once again, Luther argues his position. Readers may be familiar with Luther’s description of James as a “right strawy epistle.” Because at some point in his life Luther did not see the Divine character of several books included in the New Testament canon, if his perception of the internal witness of the Holy Spirit were the measure of canonicity, several books have been wrongly included in the New Testament. First of all, "several books" is misleading. It was four books New Testament books. When one looks at the totality of Luther’s New Testament canon criticism, it is quite minute: four books. As to the "right strawy epistle," this quote only appears in Luther's original 1522 Preface to the New Testament. After 1522, all the editions of Luther's Bible dropped the "epistle of straw" comment, along with the entire paragraph that placed value judgments on particular biblical books. It was Luther himself who edited these comments out. For anyone to continue to cite Luther's "epistle of straw" comment against him is to do him an injustice. He saw fit to retract the comment. Subsequent citations of this quote should bear this in mind. Let us remember that throughout Church history, many Christians did not hold the apocrypha to be sacred Scripture. In the 16th Century Catholic men like Erasmus, Luther, and the great Catholic scholar Cajetan expressed doubts on some of the New Testament books as well. These men all share one thing in common. They formed their opinions on the canon previous to the council of Trent. The liberty these men had was simply the liberty as allowed by the Roman Catholic Church. If the New Catholic Encyclopedia is correct, Erasmus, Cajetan, and Luther, and a host of others previous to them had every right within the Catholic system to engage in Biblical criticism and debate over the extent of the Canon. In the case of Luther, Cajetan, and Erasmus, theirs was not a radical higher criticism. The books they questioned were books that had been questioned by previous generations. None were so extreme as to engage in Marcion-like canon-destruction. Both Erasmus and Luther translated the entirety of Bible, and published it. to read more about the views of Erasmus and Cajetan (contemporaries of Luther), see my paper, Luther’s View of the Canon of Scripture. I suggest Catholics follow the criterion put forth by the Roman Catholic Church: Catholic theologians are granted the freedom to hold opinions on matters not settled dogmatically. If they do, well, I'll at least respect them for being a consistent Roman Catholics. If they still maintain criticism of Luther, perhaps they can explain on what basis they do so, for it is certainly not being consistent with the criterion put forth by the Roman Catholic Church and her infallible pronouncements. Who will/can/wants to give a full response? It seems that much of the RCC side of apologetics hinges on this question (the canon) that has convinced some Protestant Evangelicals to swim the Tiber. Maybe later I will take some of my posts and make articles here. Time is a problem with so much other ministry and responsibilities right now. I didn't view the comments- sometimes I like to read things as fresh as possible. Sometimes this is good, sometimes it's bad, but at least I wasn't swayed by comments not made by the author. Which brings up something else for anyone who may comment on this post in the next few days. I won't be looking at this post or comments until at least June 28. Another beautifully written piece – thanks for that. Your knowledge of Luther provides for an interesting critique of Mr. Brown’s thoughtful paper but I find that there are other “areas for discussion” within it, too. Too many perhaps to be detailed in this forum, but there is one that readliy catches the eye. And that is his misquote of Augustine in his opening line! A proper understanding of this quote rather negates Mr. Brown’s thesis while it is still in the starting gates. This is the oft-quoted snippet from Augustine’s “Against the Epistle of Manichaeus, called Fundamental” (from which Brown quotes chapter 6, but which in Schaff’s edition is chapter 5). Stated thusly: “I would not have believed the gospel, unless the authority of the Church had induced me.” (St. Augustine, Contra Ep. Fund., V, 6. )” What Brown misses– and most others, too – is that this quote is part of the opening of Augustine’s case against Mani and is not his conclusion. Augustine’s conclusion in this piece is not that the Catholic church is the authority that upholds the Scripture, but rather his point is the diametrical opposite. And the irony is that that position undermines Brown’s paper before the second paragraph is read. a. You tell me Mani was an apostle but I don’t believe it – now what? b. You could quote Scripture but that won’t convince somebody who doesn’t believe the Scriptures – now what? c. I believe the Scriptures because my Catholic buddies told me to and not because you told me to. So to convince me “you must put aside the gospel.” If you keep trying to use the gospel, I’m gonna have to side with my friends, because, well, their my buddies. But at this point, Augustine’s analysis takes a decisive turn. What if, in the range of epistemic possibilities, the Manichaeans could really find scriptural support for their position? What would that do to Augustine’s current understanding of both the gospel and the Catholic church? This is the part that Brown (and others) miss. d. “But if haply you should succeed in finding in the gospel an incontrovertible testimony to the apostleship of Manichæus, you will weaken my regard for the authority of the Catholics who bid me not to believe you;” Whoa! Stop the bus! What is Augustine’s ultimate authority here? If you can find scriptural support for the Manichaean position, “you will weaken my regard for the authority of the Catholics…” Scripture is the standard by which the church is to be judged and not vice versa! Augustine finishes this thought by noting that should the Manichaeans find true scriptural support for his position it would lead him to the unacceptable conclusion of skepticism: “But if you read thence some passage clearly in favor of Manichæus, I will believe neither them (the Catholics) nor you: not them, for they lied to me about you; nor you, for you quote to me that Scripture which I had believed on the authority of those liars.” It is an epistemological possibility for Augustine that the Catholics could be wrong and be, in his words, “liars”. But does he hold out that possibility for the Scriptures? No. Augustine’s point in all of this is that while he was introduced to the Scriptures by the Catholics, it is possible that they could err and be “liars”. Therefore, if he were to place the Catholic authority ahead of Scriptural authority and the Manichaeans were to find Scriptural support for their position, both the authority of the Catholics and Scriptures would be undermined thereby resulting in skepticism. And Augustine was no skeptic. And his solution to this dilemma was to return to the Scriptures and read them more fully and faithfully: “But far be it that I should not believe the gospel; for believing it, I find no way of believing you too. For the names of the apostles, as there recorded do not include the name of Manichæus.” The ultimate refutation of Mani’s claims is the gospel – period. Because Mr. Brown’s point is essentially that we cannot know the canon without following the dicates of the Roman Magisterium, he ironically places his trust in an organization that Augustine clearly allowed could be wrong all the while quoting him to the contrary! 1. If Augustine knew the canon because of the authority of the Catholic Church and, as we have seen, it is possible for the Catholics to be “liars” how could Augustine have used the Scripture with any certainty at all, in your view? 2. If Catholic authority is required to rightly discern the Scriptures, why did Augustine even allow that the Manichaeans could do so without Catholic authority? 3. Given the possibility that someone could “weaken” Augustine’s “regard for the authority of the Catholics” but nowhere does he allow for a “weakening” of his regard for Scripture, do you think Augustine thought it right to subject what cannot be weakened (i.e. Scripture) to that which might be weakened (i.e. Catholic authority)? Constantine, it is Augustine's conclusion that he would not have believed but for the authority of the Catholic Church. That's why he starts out saying "For my part I would not have believed the gospel, unless the authority of the Church had induced me." James Dean and "Augustine" -- you just ignored everything else that Constantine put forward as Augustine's argument in that document. It is clear from this that for Augustine "Scripture is the standard by which the church is to be judged and not vice versa." Can you tell me whether John Calvin or any other major early leader of Reformation ever questioned the canonicity of some Biblical books in a similar manner as Luther did? "This is the part that Brown (and others) miss." You can add Mr. Dean to the group of "and others." John, I haven't ignored it, I just haven't dealt with it "yet". Ex-Reform Protestants, now Catholics, debunk and discredit Protestantism. Then we have some ex-Catholics, now Reform Protestants, debunking and discrediting Catholicism. I learn a lot from these debates. Keep going. Although it seems endless at times. If he “starts out saying” something its not his conclusion, agreed? So the point is to find out what the conclusion is. So my conclusion is…that while A begins by saying the Catholic church convinced him to believe the gospel, it is the truth of the gospel itself that disproves Mani and his followers, and not the testimony of the Catholic church. Constantine says:"So my conclusion is…that while A begins by saying the Catholic church convinced him to believe the gospel, it is the truth of the gospel itself that disproves Mani and his followers, and not the testimony of the Catholic church." So when those on whose authority I have consented to believe in the gospel tell me not to believe in Manichæus, how can I but consent? I'll be replying more fully (without the personal insult)on my blog. I'm not aware of Calvin questioning any canonical books, but I haven't done extended studies in that area.